I recognize that these are imperfect proxies for the workforce pipeline that leads to Google, but think they are worth exploring nonetheless. It appears that black high school graduates are well represented in their interest in STEM subjects, but not well prepared — that’s the biggest drop-off (from 13% to 5%). The numbers hold steady for black high school graduates and those that get degrees in fields that might prepare them for a job at Google (5% in each case). And then the 5% to 2% drop from grads to Google hires. Clearly, there’s work to be done. The Asian and Hispanic stories are also interesting. Qualified Hispanic high school grads do not appear to go on to get as many degrees in CS, etc. while the Asian representation in tech grows with each step. As with many explorations of data, this may lead you to ask more questions than it answers. It did for me. Google is not dissimilar to other tech companies who have shared the same data, but I’d like to see actual employment data for a broader group of tech companies. That data is only just beginning to be shared with the public. Open Diversity Data is a good source. What isn’t public — and isn’t likely to become public — is data on the ethnicity of job applicants. That’s an important piece of the puzzle and one I imagine Google and others concerned with workforce diversity examine internally. Also interesting to look at the ethnicity of the population in the four counties within a commute-friendly distance of the Googleplex. I know people relocate to work at Google, but the ethnicity of those who live nearby has to be a factor. Looking at the local population of those counties (Santa Clara, San Mateo, San Francisco, Alameda), Asians are perfectly represented at Google at 30% of the population and 30% of the workforce. 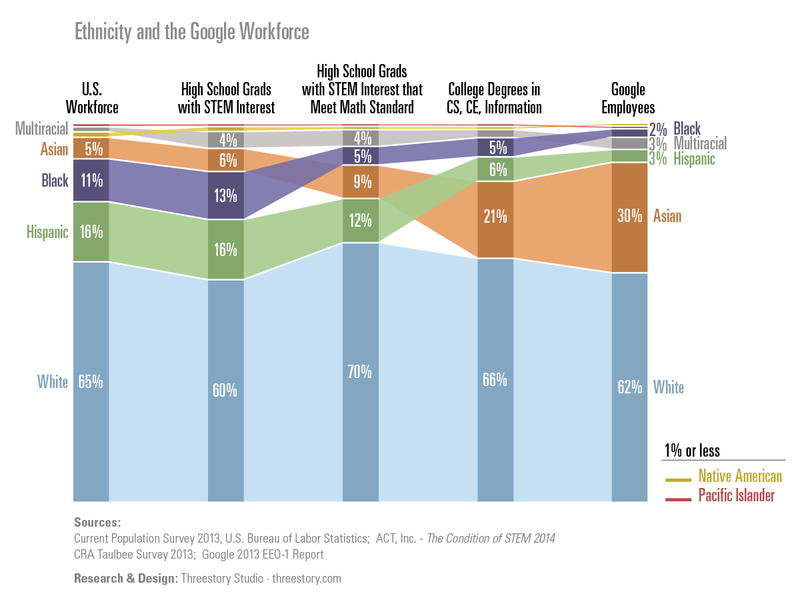 And whites are far over-represented (36% of the population, 62% of the Google workforce). I used 2013 U.S. workforce ethnicity numbers from the U.S. Bureau of Labor Statistics — slightly different than the total U.S. population that was referenced in the Fast Company article, but more relevant in this case. Data on high school graduate interest levels in STEM (science, technology, engineering, mathematics) by ethnicity comes from the people that administer the ACT test. The latest data is from 2014 graduates. ACT tracks both expressed and measured interest. The numbers I include are expressed, measured or both. They also track which of the students interested in STEM meet standards in math and science, by ethnicity. Ideally, I’d have numbers for those meeting standards in math or science or both, but since I couldn’t discern where any overlap might be, I chose to use the math standard — it was met at a slightly higher level across the board than science. Data on graduates with college degrees (bachelors, masters, PhD) in Computer Science, Computer Engineering, or Information comes from the 2012-2013 Taulbee Survey. Information degrees include Information Science, Information Systems, Information Technology, Informatics and related disciplines. Google’s workforce ethnicity data comes from the EEO-1 form Google filed with the U.S. Government, which they have made public. See also the Google Diversity page. The way ethnicity is recorded is (thankfully) fairly consistent across the different data sources. Although there were some inconsistencies (some included options for “Other” or “race not stated”, and others didn’t, for example), the discrepancies don’t materially affect the numbers that we are examining here. I’m interested in your comments, here or on Twitter.